In the Mediterranean climate, unclarified butter spoils quickly, unlike cheese, it is not a practical method of preserving the nutrients of milk. The ancient Greeks and Romans seemed to have considered butter a food fit more for the northern barbarians. A play by the Greek comic poet Anaxandrides refers to Thracians as boutyrophagoi, "butter-eaters". In Natural History, Pliny the Elder calls butter "the most delicate of food among barbarous nations", and goes on to describe its medicinal properties. Later, the physician Galen also described butter as a medicinal agent only. Historian and linguist Andrew Dalby says most references to butter in ancient Near Eastern texts should more correctly be translated as ghee. Ghee is mentioned in the Periplus of the Erythraean Sea as a typical trade article around the first century CE Arabian Sea, and Roman geographer Strabo describes it as a commodity of Arabia and Sudan. In India, ghee has been a symbol of purity and an offering to the gods, especially Agni, the Hindu god of fire, for more than 3000 years; references to ghee's sacred nature appear numerous times in the Rigveda, circa 1500 -1200 BCE. The tale of the child Krishna stealing butter remains a popular children's story in India today. Since India's prehistory, ghee has been both a staple food and used for ceremonial purposes, such as fueling holy lamps and funeral pyres. This is a easy breakfast dish, we actually had this for dinner. Whisk eggs, water, salt and pepper. Set aside. In large skillet, over medium heat, cook sausage until no longer pink. Remove from skillet, drain, transfer to a bowl. In the same skillet, cook potatoes for 5 minutes, until tender, remove from skillet. Add butter to the skillet and melt. Add eggs to skillet, cook and stir until eggs almost set. Stir in sausage and potatoes. Sprinke with cheese, cover, cook about 1 to 2 minutes, until cheese is melted. Enjoy! now this really does sound awesome! Great breakfast idea! I love breakfast anytime of day. 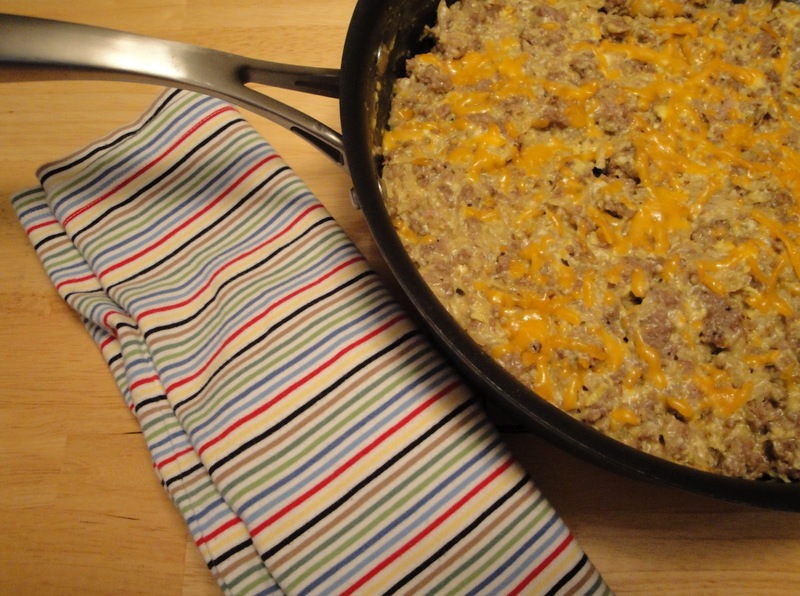 I just love breakfast for dinner, this skillet dish looks delicious! Potatoes, whole or shredded, I love. Mixed with cheese and poek sausage?? YUM. I love making breakfast for dinner. I had no idea about this fascinating history.